I just spent two weeks on the Galapagos Islands. Their economies are driven almost entirely by Eco-tourism. Like the rest of us, the people of the Galapagos Islands are utterly dependent on affordable sources of energy for their existence. As a result of a fuel tanker grounding and attendant oil spill in 2001, a consortium of energy companies from the G7, calling themselves e7 (created to bring renewable energy to developing nations), funded the installation of three wind turbines on San Cristobal, an island in the Galapagos archipelago, to minimize the amount of fuel that had to be delivered to run the generators. They also created a trust fund for maintenance and eventual removal of the turbines at the end of their twenty year life spans. My youngest daughter is studying in San Cristobal. Her class took a field trip to the power station shortly after my arrival. I sent along a list of questions. Her class was told that there is no wind for three or four months out of the year. They were also told that at least one of the five diesel generators is always running. When my daughter asked why the computer screen only had three icons for the generators when there are five of them, she was told that two of the three icons represent a pair of generators. My daughter took the above photo of the computer screen in the control room. The diesel generators were producing over half of the power (162.5 + 222.5 =388 kW of power from the diesel generators, and 239 + 231+ 236 = 726 kW from the wind turbines). 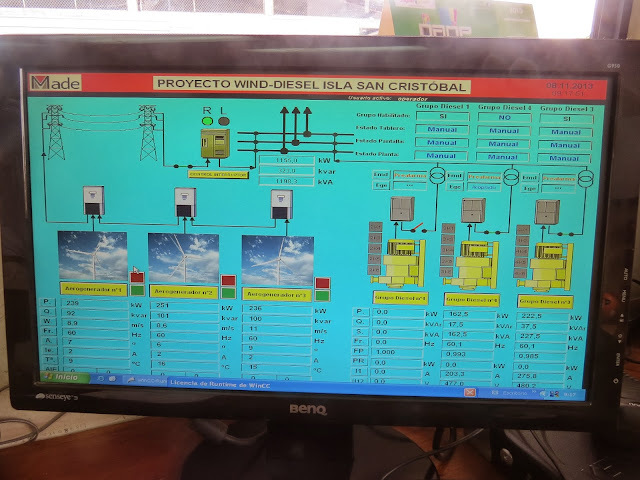 The plant supervisor had explained to the class that the San Cristobal electric power system is a diesel/wind hybrid. I was impressed. Few people understand that virtually all wind turbine installations require the consumption of fossil fuel because they are part of a hybrid system that includes some form of fossil fueled peaking power plant to take over when there isn’t enough wind. A wind turbine without fossil fuel back-up is about as useful as a car without wheels. The turbines are located on a hill about a mile away from another hill that has the only fresh water pond on the island (in an old volcanic caldera) which is frequented by frigate birds and the Galapagos White-cheeked pin-tail duck, which is endangered. The original site chosen for the turbines was abandoned when researchers discovered that it was in the flight path used by the endangered Galapagos Petrol returning to their nests in the night after fishing far out to sea. While riding a bike on a dirt road leading away from the wind turbines, I found an endangered Galapagos Rail and a common species of Darwin’s Finch within a few miles of each other that had recently been hit by cars. This gave me an epiphany. To put the bird and bat killing potential of the three wind turbines in terms of road kill, picture a 1/3 mile long oval race track in an area known to harbor endangered bird species, with nine equally spaced cars going around it at 180 mph, 24 hours a day (three turbines, each with three 100 foot long blades spinning at 25 revolutions per minute, 5,280 feet/mile, 60 minutes/hour, circumference = 2pR). There are also three wind turbines (from a different manufacturer) located on the island of Baltra. Although it was always quite windy, I never saw them spinning. All of these turbines are essentially an experiment testing the viability of wind energy in the Galapagos Islands. Will they eventually fall into disrepair and join the rest of the abandoned structures on the islands? I briefly discuss below a few other energy schemes that may also be effective at preventing oil spills. If Ecuador were really serious about protecting the “Mona Lisa” of biodiversity from the next inevitable oil spill, everything in the Galapagos would run on natural gas. Much of the taxi fleet in Buenos Aires (a city of 13 million) runs on natural gas, as does Seattle’s garbage and recycling trucks. The generators could also be run on natural gas. Petroleum products are heavily subsidized by the Ecuadorian government. Gasoline here costs $1.50 a gallon. This has, of course, created a black market for Ecuadorian petroleum products in neighboring countries. Roughly 90% of the biomass here is from invasive plant species. One of the worst is the guava tree. A system might be developed to pay farmers to haul biomass (roots and all) down the mountainsides with their donkeys to a biomass fired steam turbine or a power-from-waste combustion system with the intent of controlling or possibly eliminating some invasive species. Waste combustion is particularly popular in countries such as Japan where land is a scarce resource. Denmark and Sweden have been leaders in using the energy generated from incineration for more than a century, in localized combined heat and power facilities supporting district heating schemes. In 2005, waste incineration produced 4.8% of the electricity consumption and 13.7% of the total domestic heat consumption in Denmark. A number of other European countries rely heavily on incineration for handling municipal waste, in particular Luxembourg, the Netherlands, Germany and France. Although there is a recycling program, some of the Galapagos Islands are, literally, awash with trash. Sea turtles and sea birds will sometimes eat plastic debris and die as a result. I witnessed scrap metal being hauled to a dock and loaded by hand onto small barges which ferried it out to ships that had just unloaded cargo in the reverse order. An economically viable technology to convert cellulose into a liquid fuel does not exist. It is still more efficient to burn woody biomass for electricity or heat. Humanity is the cause of the sixth great extinction event. Habitat loss is the main driver and agriculture is the main driver of habitat loss and deforestation, which is also a significant contributor to global warming. Because palm biodiesel or cane or corn ethanol require the conversion of ecosystems elsewhere into cropland, I would not consider them any better than oil when it comes to overall environmental impact. Santa Cruz is the most populous of all the islands. The tourist district has dedicated bicycle lanes with a physical barrier separating bikes and car traffic. Bicycles are already used extensively on all of the islands because weather is rarely an impediment and because most destinations are not very far apart. Unfortunately, thanks to the low cost of motor fuel, there is less incentive to ride a bike than to drive the ubiquitous crew-cab short-bed pickup truck. The population of the Galapagos is growing rapidly because there are so many young people who are just beginning to have a family or are not old enough to do so yet, and all of their children will of course have children of their own. Thanks to ecotourism, the standard of living in the Galapagos Islands is much higher than on the mainland of Ecuador, although still well below most developed nations. It’s illegal to migrate there unless you are married to a citizen of the islands, and it isn’t legal to marry somebody just so you can. Fresh water is very limited and on some islands you shower and wash in salty water. Any kind of social upheaval that disrupts Eco-tourism or the supply of fossil fuels would be disastrous for the people and the wildlife of the Galapagos. …have a staring contest with a marine iguana.